Samsung’s Galaxy Book 12 inch and the Galaxy Book 10.6 both are aspiring devices with significant responsibilities on its shoulders given by Samsung to counter the top dogs of the market leader such as the most successful Microsoft Surface Pro and the iPad Pro. The Surface Pro and iPad Pro is a perfectly balanced device from the American software giant, while the South Korean giant’s dream is to conquer the convertible tablet that segment with its new Galaxy Book. The Galaxy book has a much more curved circular design elements to it while the Surface Pro which is its leading contender is a preferably rectangular and has a more defined chiseled look to it. 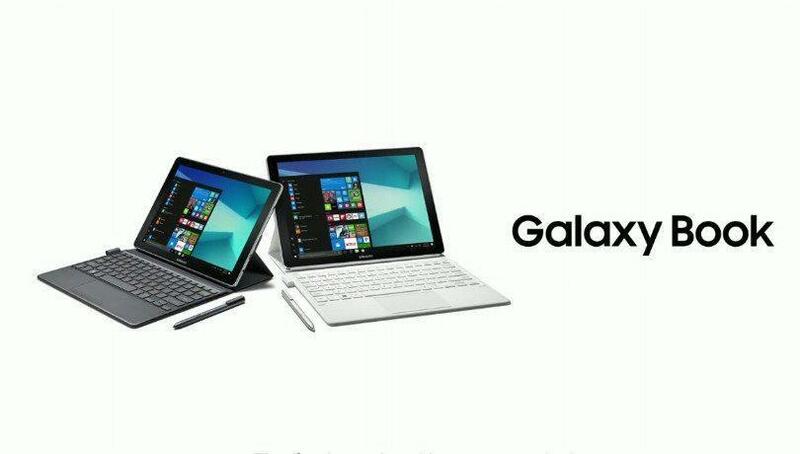 Galaxy is sleek and thin while the Surface Pro takes a more industrial approach. On the mechanical side, the surface book has a more traditional hinge while the Galaxy book doesn’t, it takes a more modern approach and it also weight’s decidedly less just 1.66lbs. However, with the hinge, the Surface Pro can be tilted to almost 180 degrees. Note: Amazon is running a promotion on Samsung Galaxy Book 12 and Galaxy Book 10.6 model. If you live in the UK, then please check this Amazon UK page. The Galaxy Book features a 12-inch Super AMOLED display sporting a resolution of 2160 x 1440 pixels, and this is the closest you can get in no small handheld AMOLED panel, after the 10-inch Galaxy Tab. 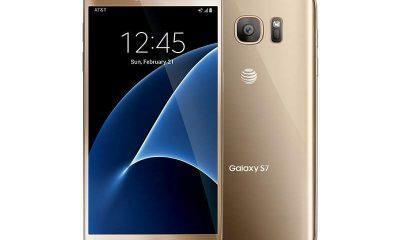 The AMOLED display is sharp and has excellent saturated colors, and your an expect those typical punchy colors from Samsung’s AMOLED panel. The bezels won’t wow anybody in this era but its acceptable. On the other hand, the smaller cousin is left behind with a 10.6-inch 1080p, which is sadly a TFT LCD panel, so no punchy colors and superior deep blacks, however, what it offer’s is better viewing angles and excellent sunlight visibility as the brightness goes more than 400 nits. Moreover, the stylus provided with it has low latency, and people who like taking handwritten notes on it won’t face any issues while writing fast on the gorgeous screen. 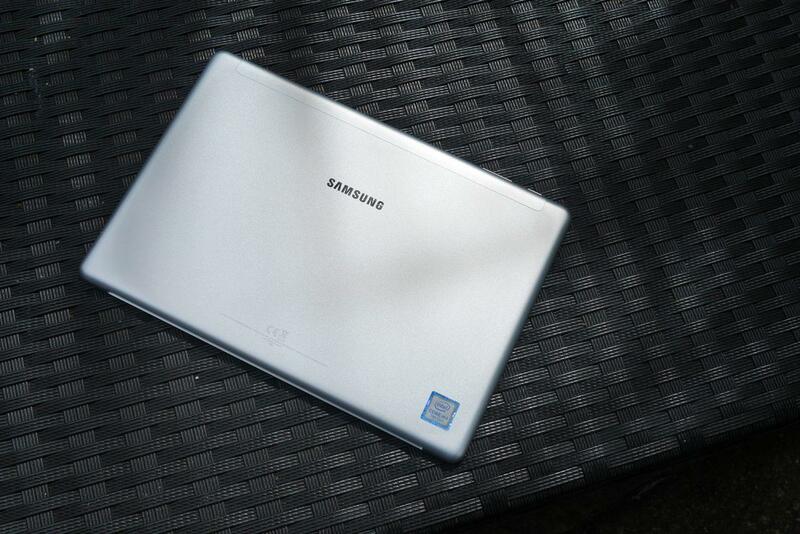 So, this is a plus point for the Galaxy book 12-inch as no-other device offers it. If you’re more into media consumption, then the 12-inch Galaxy Book device is for you. However, graphics artist should stay away from this as the color accuracy is far from the real deal/Adobe RGB. Battery Life 8 to 10 hours on average usage. Battery Life 7 to 8 hours on average usage. Now coming towards the Performance side here also the Galaxy book running on Windows 10 Home doesn’t disappoint in this department, its powered by an Intel Core i5 7th Gen chip clocked at 2.5Ghz (turbo boost up to 3.1Ghz). A much better processor the any of the core M series, paired with 4GB RAM which is just okay for multi-tasking and apps open and close very quickly and overall the experience is a smooth and flawless performance. However, don’t expect that it will edit 4k videos in Premiere Pro or be creating any motion graphics in after effects it just won’t do it with its 4GB/8GB RAM. And also in the absence of any dedicated video card to boost it, the built-in Intel 620 HD graphics are just right rendering webpage content or some light editing in Adobe Lightroom. Interestingly, now with the Windows 10 falls creator update, you can do even more with Microsoft’s remix editor. So, yes there’s still a lot of scope in here. Yes, you will not receive any Samsung Oreo update because the devices don’t run on Android OS. 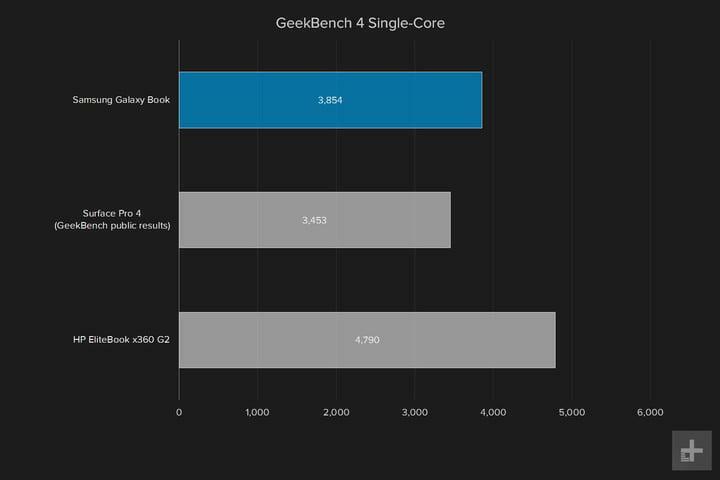 Here’re some benchmarks of the Galaxy Book’s single core and multi-core against its rivals. But sit back its got a super fast 128GB/256GB SSD ensuring apps load quickly as well as the read write speeds are amazingly quick. Another thing to note is that don’t expect it to play GTA V or any of those graphics-heavy titles. Games from 2012 or earlier to 2014 should run fine on shallow settings, and all the graphics stripped down to an almost crappy looking gaming experience. Watching movies on here is just a pleasure with its inky deep blacks and popping colors you’ll have a good time watching 1080p movies at 60FPS, it does well, audio is low on bass, but the vocals are reported to be very crisp with its dual speakers. While the Galaxy Book 10.6 packs a more standard spec sheet, Samsung has equipped it with a Kaby-Lake Intel Core m3-7Y30 processor which is a Dual-Core chip clocked at 1.6GHz and has a Max turbo boost up to 2.6GHz. On the memory side, it’s also a stripped down version of its larger cousin, coming in at just 4 Gigs of RAM and the storage is even sliced in half which falls to only 64GB, out of which the available space is not much to talk. Fortunately, you can expand it via sd-card maxing out at 256GB. Editing on this 10.6-inch Galaxy Book will be a challenging chore, compared to both the 12-inch and the iPad as well as the powerful surface pro. So where, does this leaves the 10.6inch Galaxy Book? Nothing more than just a below average, mediocre performance, no gaming unless its a very lightweight title, and the display like we talked earlier is just meh and stands nowhere compared to its larger cousin and there’s no competition with the iPad Pro either. Now talking about the accessories as aspected this is a laptop hybrid solution, you get the portable keyboard which has high-end build quality; Oh and it’s backlit too, comes with stage brightness settings! The touchpad is also not that terrible, but you’ll be better off with a proper external mouse. Along with that, Samsung was also generous enough to throw in a stylus which is also used by its Galaxy Tab S3; coming back to the keyboard they essential travel is decent enough for this kind of attachment implementation. It doesn’t feel cluttered and overall a solid build, is it better than the surface? To be honest its a close match on both sides. And you get these accessories with both the models of the Galaxy Book! Other things the Galaxy Book 12 provides is surprisingly a decent camera coming in at 13MP with auto-focus f/1.9 on the rear while on the selfie front you get an average 5MP f/2.2 front snapper. 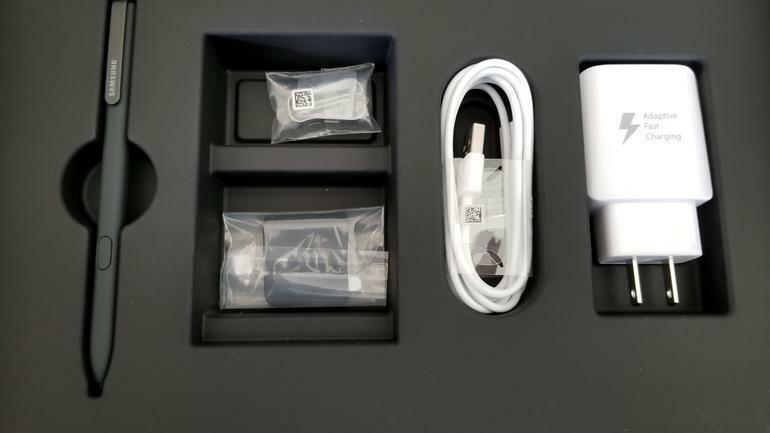 On the connection side, Samsung has heard the call of the future and has given a USB-type C port on the Galaxy Book 12; WiFi Direct is here along with GPS. The little sibling here again falls short in the camera department as its missing the rear shooter but houses a 5MP fixed focus snapper which should suffice for decent video calling sessions. And the 3.5mm headphone jack is also here as expected, don’t worry this is a big device and has enough room for one, so the audio jack isn’t going anywhere soon. Apart from that, the battery life claimed by Samsung is 11 hours, but as you already know, there’s no way you get the claimed one. But the Galaxy Tab book managed to get around 7 to 8.5 hours of screen-on-time. The 5070mAh power pack with Samsung’s adaptive charging will get full within 3 to 4 hours, so you don’t have to charge it every night. While the smaller variant’s 4000mAh pack will last for about 6 to 8 hours as reported, but heavy usage will significantly drop the battery life. Overall, the Galaxy Book is a good alternative if and only if you want that punchy AMOLED display for media consumption and the bonus accessories that you get inside the box. Other than that the Surface Pro is still a better choice for if you want a notch higher experience along with high portability. The 10.6-inch smaller variant isn’t that good to watch movies, it will do fine, for daily tasks such as web-browsing editing documents and such, the main reason to consider is that its Ultra Portable and can quickly sneak in your backpack and go everywhere with you without adding any weight. Furthermore, the Galaxy Book 12-inch retails for around Samsung $999.99 for the 4GB RAM and 128GB variant, while the 8GB option will cost $1,197.99. Talking about the smaller hybrid variant, it retails for $529.99 (INR 40000)for the 4GB/64GB model. The accessories that make it such a great buy need you to buy the necessary tools separately, so you have a better price justification for both the Galaxy Books. Also, read our in-depth guide on all the mods and APKs GBWhatsapp, Whatsapp Plus, OGWhatsapp, iOSemus, Panda Helper, Tutuapp, Showbox, GBWhatsapp Plus, Lucky Patcher and Poco F2. 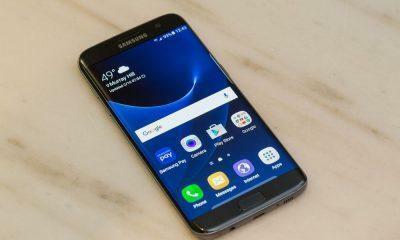 Will the Galaxy S7 and the Galaxy S7 Edge get the Android Oreo update?